There’s only one month left to go . . .
Have you been busy making blocks? There usually seems to be a flurry of sewing this time of year from people who are finishing up Christmas gifts and other projects. Hopefully, if you’ve been doing that, too, it has boosted your block count. I did not keep very careful track this past month, so I may be forgetting to add some of mine in — from what I did count, though, I came up with 229, which is a really good month for me. I made a guild exchange block, and naturally, forgot to take a picture of it. I can never remember to snap pictures of those blocks, for some reason. I’ve been working on a really complicated quilt since July, and I waited to count all the blocks for it until I was done because I didn’t want to lose track of what I’d already counted and what I hadn’t. I can’t show you the quilt just yet, but the top is finished (it still needs to be quilted), and it contains 218 blocks, which I can now count without getting confused. I sure have run a lot of things through my sewing machine, but none of them have turned into finished blocks yet. I’ve made a lot of Christmas stockings, done several bindings, and worked on setting blocks together — none of which counts toward my block total. Of the scrappy stuff I’ve been working on, I made some more of these. I forgot to count exactly how many, so I’m going to say 10. And I really need to start setting these together, so I can tell how many more I’m going to need. I’ve updated the page with the totals for this final month. Another 30 blocks this month, which gets us to our ultimate goal of 350 blocks for the year. Woohoo! So, tell me . . . What did you get done in November? It’s time to report in with your totals, and let me know how you’re doing. As always, if you have a link to a post of your own, especially with pictures, we’d all love to check it out. Although, when I do, it always makes me want to go start a new project! The prize winner for October is Barbara De. Barbara is up to 254 blocks for the year so far! We have one month left — some of you are well over 350, so I’m excited to see exactly how many you end up with for one year. Some of us are still striving for the first 350 — will you make it in time? I know it’s a busy season, but try to get in some sewing time — it’s relaxing, you know . . . While you’re here, I’ll tell you that I made a big announcement over on my other blog today — The Life of Hazel Ilene — go check it out — and get caught up so you can join me next year for some exciting stuff! 268 blocks this month…..it was the month for baby quilts and finishing up. So glad you keep track. MAkes me realize I have been busy. So happy about Hazel Ilene! 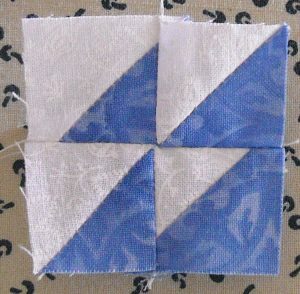 Right now I am not piecing much and only have four blocks to show for this month. On the other hand, I have finished 13 quilts. I miss making blocks but making finishes is good, too. My total for the year is now 303. Although I have been busy, busy sewing I only made one block this month. I think my sewing machine would like me to go back to making quilts so it can have a rest. This is a list of things completed this month: Quilted 3 quilts – only one binding completed – thankfully I quilted one for a friend and will not have to bind it – so one remaining. I made 16 aprons for a birthday party – boys and girls ages 2 to 12. My great nieces and newphews – which were adorable in the aprons. I also made a minkey blanket, car seat cover & stuffed doggy for baby showers this month. I made 10 little girls dresses, a coat for my granddaughter, and pieced a wall hanging and a quilt top – both which now needs quilted. I finished my brother’s Quilt of Valor and made the top of a twin sized “baby” quilt, to go on the baby’s eventual twin bed once she gets big enough. I had a total of 72 blocks this past month. I accomplished 20 blocks and made 2 baby quilts. 46 blocks for me. Much if my time was spent finishing off a Christmas wall hanging and a baby quilt this month. I pieced or appliqued 69 blocks this month. Probably won’t get much more done since I have to finish a couple of gifts. Even thou I didn’t make any blocks for the month of Oct or Nov my running total is at 422. I have shown some pictures of the quilting on two of the quilts that I have completed with some of the blocks that I did this year, on my blog. None for me this month, but I did get the Happy and Scrappy quilt rows put together. So I’m pleased about that. I’m still so thrilled to read about your book coming out; such great news! I got 39 blocks done this month. Probably won’t be adding any more to my count in Dec. since I have 4 quilts to quilt and 5 to bind before Christmas–yikes! And I started the new Bonnie Hunter mystery……I think I need an extra 12 hours in a day this month! I got 25 done. I may never win a prize but I am having fun! I made 25 blocks in November. I am still working on my flowering snowball blocks and my charming star blocks. I made 20 blocks this month. Finished up 9 more applique blocks. This was a finishing month for me, too. Borders and backing pieced for a quilt that I will quilt myself; backing pieced for a QOV that I will drop off next week to be long armed, also did the binding & pillowcase and 14 random leader ender blocks, very scrappy, enjoying those. I also started the new Bonnie Hunter Mystery Quilt: Grand Illusions! I’ve made most of Clue 1, but I am not counting those units until they go into finished blocks early in 2015! I will be interested to see how you set you little triangle blocks. My Leader/Ender is very similar. I did find my new favorite pecan pie recipe along the way this Thanksgiving though…Thanks Shelly!!! Only 6 blocks done this month, but it knew I would be spending most of my available time quilting a quilt. I did get it finished as well as cooking Thanksgiving dinner and traveling to see Sailor grandson for a few days. It was still a productive month. 81 new blocks for the month, for a total of 761 for the year! just found the blog and the block challenge, will you be doing it for 2015, sounds like just the thing to keep me accountable, what constitutes a block? Is it just cutting, or piecing? I make a few ‘scrappy’ quilts for charity that are coins, or charm sized with sashings how would I count them? PS I also did the clearing challenge final count down which I found through a link from another blog, Thanks.